The Yantra cloth is intended for carrying in the purse, wallet, or cashtill, to attract good business and customers, and induce mercy charm and seductive influence. The Pha Yant is empowered with various Incantations, each of which can be used to onvoke specific magical spells, for different purposes. An explanation of how to invoke the different powers is given at the end of this article. In the Thai Mythologies, Pra Pirab is a Yaksa Giant who is featured in Valmiki's Ramayana, and is a Deity of the Thai Buddhist and of Brahman People. Pra Pirab is a Lersi Hermit sage, and is a Great Astrologer and Magician. Pra Pirab is a Powerful High ranking Royal Member of the Asura Realm Pantheon of Deities, and is known to be the Guru of all Performing Artists and Musicians. Pra Pirab is a very Powerful Magical Emanation, and possesses Maha Amnaj Power to produce 'Serm Yos' (Improve Status), and Impose Commanding Influence over others. Pra Pirab also Destroys Enemies and Backstabbers, much like the Eclipse God 'Pra Rahu'. Hence, 'Bhairaba', became first 'Pairab' and later slowly transformed into 'Pra Pirab'. 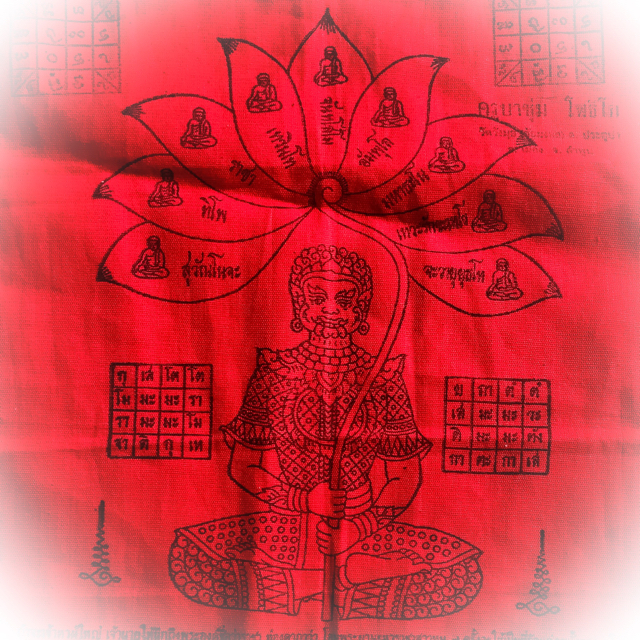 Historically one can see Pra Pirab appear in Thai Performing Arts and Ritual Ceremonies documented, from about the time of the Ayuttaya Dynasty. The ritual worship of Pra Pirab was first seen to be commonly widespread during the time of the 2 King of the Chakri Dynasty. In the Tibetan Vajrayana, Pirab is called 'Bhairava', and represents the wandering form of Lord Shiva and they guard the cardinal points. There are 64 Bhairavas. These 64 Bhairavas are grouped under 8 categories and each category is headed by one major Bhairava. The major eight Bhairava's are called Aṣṭāṅga Bhairavas. The Ashta Bhairavas control the 8 directions of this universe. Each Bhairava has eight sub Bhairavas under them, totaling 64 Bhairavas. All of the Bhairavas are ruled and controlled by Maha Swarna Kala Bhairava otherwise known as Kala Bhairava, who is the supreme ruler of time of this universe as per Hindu scriptures. Bhairavi is the consort of Kala Bhairava Bhairava is also called as protector, as he guards the eight directions of the universe. In all Hindu temples, there will be a Bhairava idol. This Bhairava is the protector of the temple. In Shiva temples, when the temple is closed, the keys are placed before Bhairava. Bhairava is also described as the protector of women. He is described as the protector of the timid and in general women who are timid in nature. The Pha Yant has Pra Pirab seated in Meditation performming Incantation which emanate above his head as the nine lotus petals with Arahants emblazoned on them. each lotus petal has a'Hua Jai' Heart Mantra, from a longer Incantation. Each petal contains a different Incantation, which invokes different types of magic. He is surrounded by supplementary magic squares Yantra to cover backs of the primary spells. Pra Pirab is Inherently Imbued with Maha Amnaj (commanding power and influence), Gae Aathan and Serm Yos Power, and is especially powerful Deity to watch over, guide and protect those in the Performing Arts Professions, Musicians and Dancers, as well as all Magicians. He is also the Deity of the Science of Astrology, and worshiped as the Kroo Ba Ajarn of this Profession. He is seen to be worshiped in many great Wai Kroo ceremonies, and is the official Mascot of the Wai Kroo of Performing Artists along with a number of other Major role players in the Pantheon of 'Duriya Taep' performing Arts Heavenly Devas. Pra Pirab is the Highest Kroo of the Dancing Arts and the Musical Arts. He has various different names, the Original coming from the Indian 'Bhairaba'. As the Hindu Brahman Faith entered into Siam, the people of Siam adopted their Dance, Theater and Literary Arts, and adapted them by changing the artistic interpretation, style of regalia and their Names. The origin of Bhairava can be traced to a conversation between Brahma and Vishnu which is recounted in the Shiv Mahapuran. In it, Vishnu inquired of Brahma, "Who is the supreme creator of the Universe?" Arrogantly, Brahma told Vishnu to worship him as Supreme Creator. One day, Brahma thought "I have five heads. Shiva also has five heads. I can do everything that Shiva does and therefore I am Shiva." Brahma became a little egotistical as a result of this. Additionally, he began to forge the work of Shiva and also started interfering in what Shiva was supposed to be doing. Consequently, Mahadeva (Shiva) threw a small nail from his finger which assumed the form of Kala Bhairava and casually went to cut off one of Brahma's heads. Luang Phu Kroo Ba Chum of Wat Wang Mui was one of the Great Guru Masters of the Thai Lanna Northern Sorcery Tradition, whose Talismanic Amulets command great respect and reverence, and are Legendary Prominent members of the Dtamra Lanna. His amulets are considered Master-Class, and are seen to grace the showrooms of the top auction rooms and museum cases of the serious devotee-aficionado, and avid collector of the Lanna Genre of Thai Buddhist Amulets. Luang Phu Kroo Ba Chum Potigo, of Wat Chai Mongkol (Wat Wang Mui), in Lampoon was born on the 7th February 2442 BE in the year of the Pig. He was given the name of 'Chum', with the surname of his parents Mr Moon, and Mrs. Lun 'Pla Win'. he had 6 Siblings, 3 of them sisters, and was the 5th child of the marriage. His family were an Ethnic Minority known as the La (or sometimes called 'Wa' or 'Lwa') people, and were farmers by profession. When the young boy Chum was old enough to help his parents with the farm fields, and the household chores. He was an extremely helpful child and was always doing more than is share to relieve his parents of their burdensin all areas of the daily workload. When Kroo Ba Chum reached adolescence he went to study and be schooled at Wart Sri Sorng Mueang (Wat Hang). He learned the ways of chanting the many Mantras and Pali Prayers, and the Dhamma from the abbot of Wat Sri Sorng Mueang. Because Kroo Ba Chum was an excellent listener and learner, highly attentive, and caught on very quickly,he because the most favoured student of the abbot and other monks of the temple, and he was able to listen and learn the Dhamma of the Lord Buddha to the point of excellence, receiving the teachings every day as he attended and sought out the abbot for more teachings. This basic early foundation of training was to bring Kroo Ba Chum his great enlightened understanding of the Buddha-Dhamma very early on in his life. This in turn cause Kroo Ba Chum to see the Ordained Sangha and the path of the Buddhist Monk to be the most attractive option in life, and he developed greater interest in the Ordained Life. Kroo Ba Chum thereafter studied Dhamma theory and practiced applied Meditation and Vinaya with ever increasing diligence and intensity. and the 40 Vipassana Kammathana methods as taught and decreed as the proper practice by the Lord Buddha Sakramuni. He developed is skills and purified his heart of the many Kilesas (Defilements) which shroud it. Iin addition to developing the eightfold path, he also studied aside from this the Sacred Agkhara lettering of magical inscription, and the methods of spellcasting and empowerment of amulets, including the great Dtamra Yant Maha Pichai Songkram Ritual, which was used to conquer enemies and win wars in ancient times, and is one of the most complex and difficult Wicha to Master. Luang Phu Kroo Ba Chum was able to meet and learn deeper methods of Vipassana Kammathana methods from the great Kroo Ba Srivichai, and empowered his mind with more steadfast concentration, liberating it from the three marks of existence and advancing towards the path of stream entry with Vipassana. Diring his years of Tudong Wandering, he was able to receive training from some of the greatest Lanna Masters of that Era, the most well known being; Kroo Ba Saen of Wat Nong Hmu, Kroo Ba Gam, of Wat Nam Jai, Kroo Ba Prohma of Wat pPa Puttabat Tak Pha (also known as Kroo Ba Prohmajak), and many others. This compendium of spells within the Pha Yant brings Metta Mahaniyom Kaa Khaay Prosperity Magic for Good Business and Professional Success, and Protection against all Physical and Magical Dangers, and Disastrous Circumstances.